Saturday is here, and everyone is doing something fun to celebrate the first day of the weekend. Some people like to go to the park and walk around enjoying the fresh air and sunshine, but others like to go to the beach and have some fun. While at the beach, some people like to bury things, which brings us to today’s optical illusion. 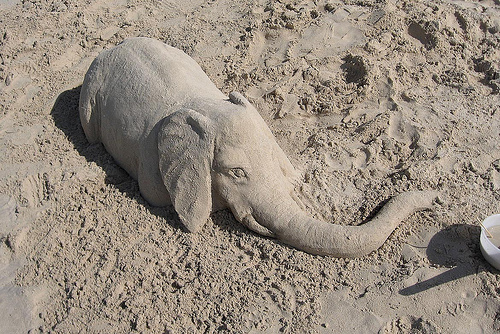 Take a look at this picture of a baby elephant that is buried in the sand. Do you all notice that it is not a real baby elephant, but an optical illusion? Ready for more fun optical illusions? Ever worked in an office setting with a lot of practical jokers? These optical illusions are all about pranks in the office, which can be a lot of fun under the right circumstances. One look at these office pranks, and you will never look at an office the same way ever again! Some people think that offices are all boring and stuffy, but these fun pranks show just how much fun it can be to work in an office. We hope you all are having a great weekend, and we will speak again very soon! Have a great weekend everyone!